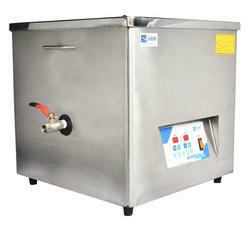 We offer wide range of Ultrasonic Cleaners For Industrial Manufacturing. These machines are regularly tested on strict quality parameters. We also deliver them as per our client's specifications. Ultrasonic Cleaners for Industrial Manufacturing is designed using supreme class base component and cutting edge technology at par with international standards. Moreover, we offer this machine in different specifications and can also be customized as per the needs of the clients. The ultrasound can be used with just water, but use of a solvent appropriate for the item to be cleaned and the type of soiling present enhances the effect. Looking for Ultrasonic Cleaners For Industrial Manufacturing ?